We provide direct LTL trucking to 48 states with shipments cross docked only one time in St. Louis and sent directly to the destination, resulting in low claims rates of only .001%, an industry low. 90% of our drivers are Haz-Mat certified and we specialize in an ability to offer special handling for some of your most difficult shipments. We offer full service trucking, warehousing, and distribution services. We offer LTL trucking for shipments from 3 to 20 pallets at competitive freight rates. Shipments over 20 pallets or 32,000 pounds can be transported as full truckload shipments, giving a competitive price advantage. Our service days are the same or better than any common trucking carrier to most points in the U.S.
We offer 6 local city trucks which perform pickups in and around the St. Louis area every day, ensuring that your shipments are picked up when you want them to be. We have a 57,000 square foot warehouse in St. Louis. This is temperature controlled and rated food grade offering our clients a safe environment for short or long term storage and inventory control. Our drivers and office staff are professional, experienced, and knowledgeable to offer you friendly, reliable, and expert trucking services. Our staff will provide all inclusive freight quotes and problem solving solutions for your shipping needs. Learn more about why Shippers, 3PLS, and Brokers choose LTL Systems as their Haz-Mat certified, full truckload, and LTL carrier online or contact our trucking company for a free freight quote and to learn how we can meet your freight shipping needs. The primary advantage of LTL Systems over other trucking companies is our ability to offer DIRECT to destination shipping from our St. Louis warehouse without transferring product along the way at break bulk terminals. This eliminates handling claims, which in turn saves our customers time and money by allowing them to avoid costly claims processing. When dealing with our trucking company for any freight shipping service, our customers have peace of mind, as we are consistent with offering quality of service at competitive prices. We can provide LTL trucking and full truckload shipping to all 48 contiguous states originating from our warehouse located in St. Louis, Missouri. 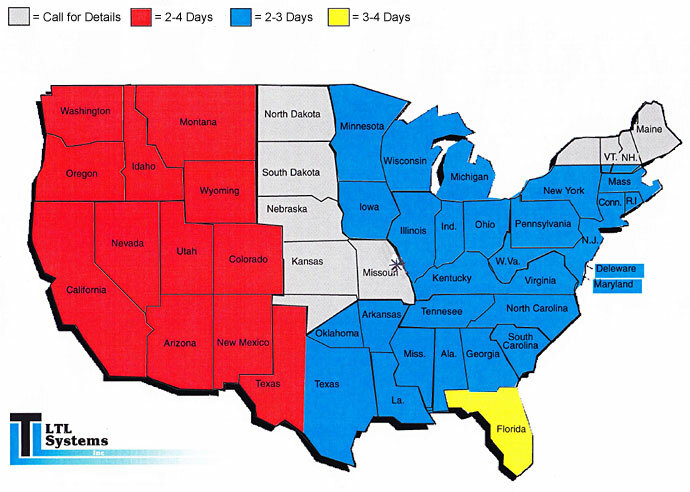 For most trucking shipments, our service days are equal to or better than any common carrier to most points in the United States. If you would like to learn more about our trucking company or the freight transportation services that we offer, please contact us directly at 314-862-9292 or toll free at 800-969-2584 to talk with one of our experienced and professional staff members. You can also request a freight quote quickly by completing our online freight quote form. No matter what your trucking needs, our friendly and professional staff looks forward to working with you to develop a solution for even your most difficult trucking and special freight transportation needs!